Schaeffler cannot survive without state aid, says the IG Metall. Pictured is the company's headquarters in Bavaria. MUNICH -- Schaeffler Group has denied a report that Chief Financial Officer Thomas Hetmann is leaving the company because of pressure from its banks. Hetmann was a key driver of Schaeffler's hostile takeover of Continental along with Schaeffler CEO Juergen Geissinger. The takeover has saddled Schaeffler with debts of more than 10 billion euros. Schaeffler said Hetmann will leave the company because of differences over the future strategic direction of the company. It added: "Management changes are decided inside the company, not by banks." Schaeffler is saddled with huge debts after its 12.1 billion euro takeover of the three times larger rival Continental in January. Schaeffler controls 90 percent of Continental shares. The Financial Times Deutschland said on Wednesday that Schaeffler's banks had pressured Hetmann to leave. The newspaper said Schaeffler owes 5 billion euros to the Dresdner Bank, 2.5 billion euros to the Royal Bank of Scotland and about 2 billion euros to the HypoVereinsbank. The newspaper said Schaeffler's creditor banks have appointed accountants Ernst & Young to obtain an overview of the family-run supplier's finances. Company insiders complain that the banks are making Hetmann scapegoat for the Schaeffler's troubles, the Financial Times Deutschland reported . Schaeffler is seeking about 4 billion euros in low-interest loans from the German federal government and from regional governments where it has factories. Wolfgang Mueller, of the German labor union IG Metall, said Schaeffler cannot survive much longer without government loans. Mueller said Schaeffler is paying 70 million euros a month in interest payments. "It needs government loans immediately," he said. Schaeffler will present a restructuring plan for its business to the German government within the coming two weeks as a prerequisite for receiving state aid, a person familiar with the matter told Reuters. The company has recorded a 20 percent drop in new orders recently, with even larger declines in individual units, the source said. Germany's Economy Minister Karl-Theodor zu Guttenberg last weekend told a newspaper that providing Schaeffler with aid was a "last ditch" option. 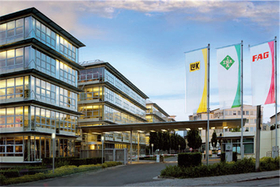 Schaeffler makes bearings, engine components, clutches under the INA, FAG, Luk brands. In 2007, its revenues were 8.9 billion euros. Continental has targeted annual sales of 25 billion euros for 2008.